Suicide is not merely the act of an individual; it always has an effect on others and can even increase the risk of suicide in the bereaved. The International Association for Suicide Prevention, the World Health Organisation, and others have recognized postvention as an important strategy for suicide prevention. This unique and comprehensive handbook, authored by nearly 100 international experts, including researchers, clinicians, support group facilitators, and survivors, presents the state of the art in suicide bereavement support. The first part examines the key concepts and the processes that the bereaved experience and illustrates them with illuminating clinical vignettes. The second and third parts look in detail at suicide bereavement support in all the relevant settings (including general practices, the workplace, online and many others) as well as in specific groups (such as health care workers). 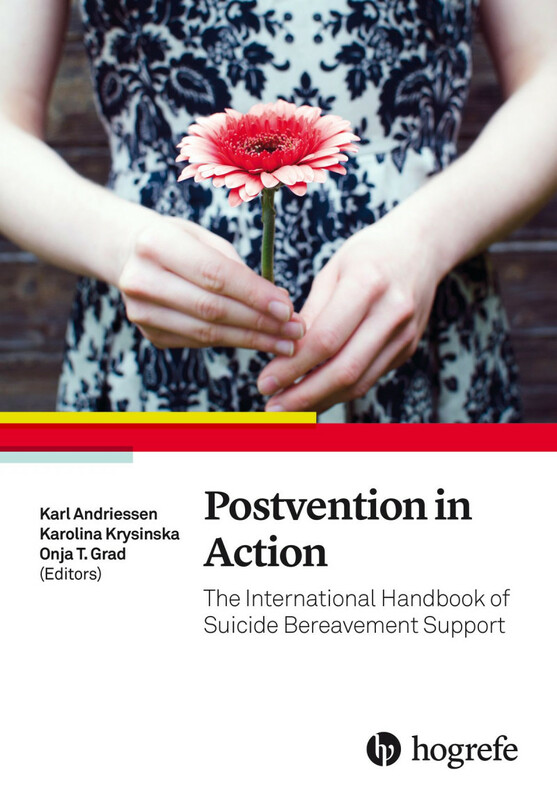 In the concluding section, the support provided for those bereaved by suicide in no less than 23 countries is explored in detail, showing that postvention is becoming a worldwide strategy for suicide prevention. These chapters provide useful lessons and inspiration for extending and improving postvention in new and existing areas. This unique handbook is thus essential reading for anyone involved in suicide prevention or postvention research and practice. "I can warmly recommend this book to anyone who encounters suicide-bereaved individuals, professionally or as a layperson. Its scientific grounding and readable language are appealing. The inclusion of both quantitative and qualitative research makes for a nuanced perspective that is unusual but much needed. The handbook presents the state-of-art of suicide bereavement support, and will be of great value for the clinician, researcher, lecturer, and policymaker who wishes to be updated on postvention research and practice. [It] provides a comprehensive overview of suicide postvention today, including current knowledge and implications for suicide bereavement support in diverse settings and populations." "Across the world’s widely varying suicide support programs, one theme is constant—the need for community. Each chapter in this volume, in its own way, highlights the essential roles that meaning making, story, and dialogue play in human healing and the importance of providing social contexts in which people can share their values and emotional experiences." "Almost 100 experts, including Australians, have contributed to this unique resource.The book begins with key concepts experienced by people bereaved by suicide, and concludes by exploring support in 23 countries." "Suicide postvention is the support of those left behind after a suicide. This approach was developed by Edwin Shneidman and Norman Farberow, pioneers of suicide prevention. I think they would be cheering for this book which carries on their work. Edited by Karl Andriessen, Karolina Krysinska and Onja T.Grad, contemporary leaders in postvention and suicide bereavement research, it’s satisfyingly solid from an academic perspective, yet very readable, uniting thought and research with a heart that brings balance, warmth and understanding, a perspective that invites a reader into wanting to know more. This book holds a wealth of information that supports goals related to developing effective postvention supports. It’s informative and inspiring, it discusses what’s possible, what works and why, while noting limitations and sizable gaps in the research. It prompts action. There’s a structured flow to the text, with readings grouped thematically. Part 1 looks at current knowledge and what this implies for support. Part 2 covers suicide bereavement support in different settings, while parts 3 and 4 look at different populations and countries. Policy-makers, researchers, clinicians, people working in this area, bereaved, counsellors, students, those simply wanting to learn more – use this book, read it, dip in and out as you need to. It inspires. It educates. It leads. It’s terrific." "This comprehensive handbook on suicide bereavement sets the standard for addressing postvention. [It] is a helpful read in an area of utmost importance that is lacking books of this caliber [and] a great help to anyone dealing with the aftermath of a suicide of family member, friend, or a patient. It should be in the libraries of hospitals, churches, therapy offices, and schools as a reference for individuals struggling with the death of a loved one." "This book is essential reading for anyone interested in understanding and helping people bereaved by suicide. It is comprehensive and describes evidence-based best practices from around the world."